I have kitties. My children love them so! They are fat and happy :) This giveaway will be good for anyone with a pet as a gift or something for your own pet. Will this be for you or a gift for a friend? 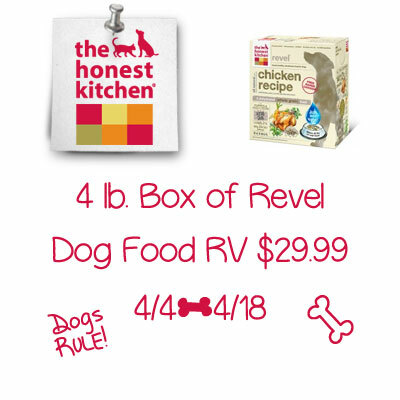 Come enter the Honest Kitchen Revel Dog Food #Giveaway - RV $29.99. We feed dry food to our pets. I feed my dog a little bit of both. I feed him dry food daily and periodically wet food as a treat. I feed my dogs dry food and a spoonful of wet as a treat at night. We feed wet & dry dog food to our dogs. I mostly feed my dog dry food but if we'll be gone for a while I'll leave him wet food as a treat. My dogs get dry food and table leftovers. We feed our dogs mostly dry with the occasional wet food as a treat or mixed in with the dry. She is fed both wet and dry food. I currently feed them dry food. We feed our family dog dry food. I feed our dogs dry food and sometimes a scoop of wet when they need there medicine. I feed my dogs dry food. I feed my dogs a mix of both.